Golfers of all levels can benefit from the professional tuition offered by The Navarino Golf Academy, make use of the outstanding golf facilities, benefit from a wide array of golf packages with everything from shoes and buggies to full sets of golf clubs available for hire, and experience the sheer joy of golfing in Greece. Flame Restaurant, located in The Dunes Club House, specializes in expertly cooked steak dishes prepared from finest quality locally sourced meat, complemented by the freshest ingredients, together with herbs and vegetables from the restaurant’s own gardens. Tough starting hole that will test your game, so being warmed up is important. This is the only hole with visible water hazard to the left, but this is generally not in play for most golfers unless there is a strong wind in your face. 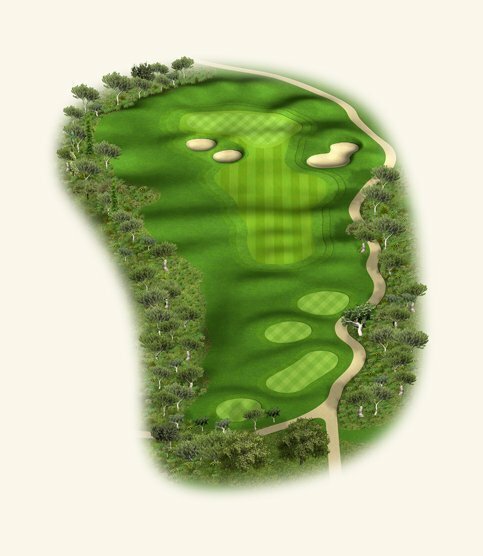 The ideal tee shot is just left of the right fairway bunkers, leaving you a long second to a large three-tier green. Left of the green is trouble so better to bail off to the right if you’re unsure of getting there. A par here is a great start. Beautiful view of the Ionian Sea on this hole. Avoid the bunkers of the tee, leaving you with a short- to mid-iron second shot to the green. The green slopes from right to left so it is better to approach from the right. Be careful when attacking the pin on the left-hand side because if you’re a little short the ball will funnel off the green, leaving a difficult chip. Going over the green will also probably result in a lost shot or two. Straight away tee shot up the fairway to the right of the left-hand fairway bunkers. Second shot is either left of the second wave of fairway bunkers or, for better golfers, the ideal line is to go directly over them, leaving a simpler approach to the green. 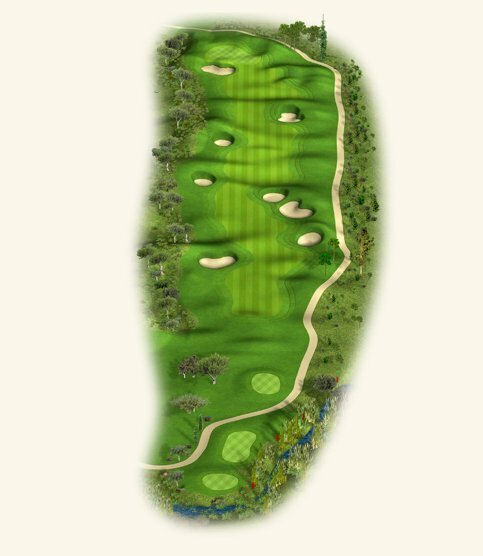 If the hole is located in the front or middle of the green, it requires a far more accurate 3rd shot, so try to approach with the shot that is most comfortable for your game. Any shot short or long will require a very good bunker or chip shot to save your par. 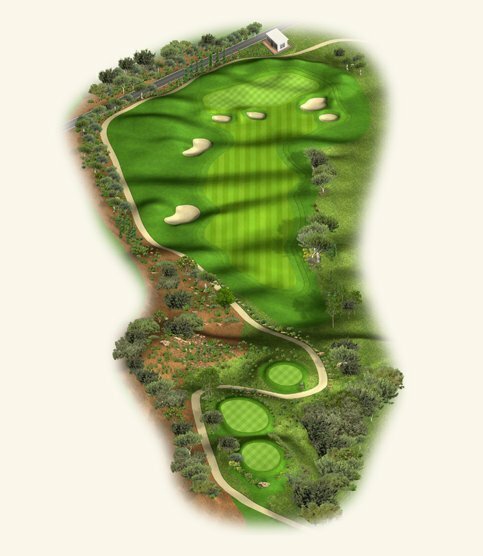 The longest par 4 on The Dunes Course at 443m from the back tees, this is a very tough test of your golf. 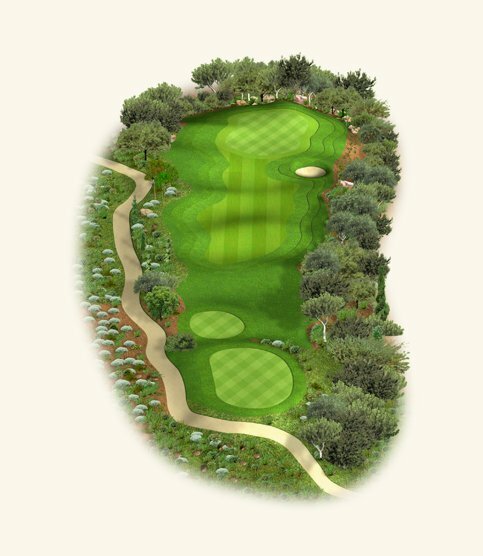 Keep your tee shot right of the olive trees on the corner. Do not attack the back right hole location, as you will generally end up in the greenside bunker or over the green with a difficult up and down. 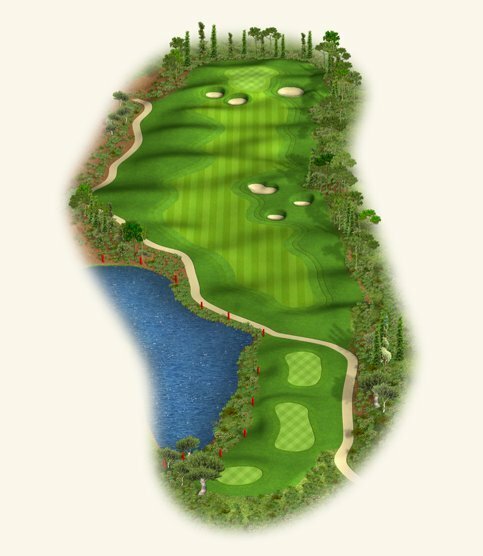 You are better off finding the middle front of the green and trying to make a two-putt from the lower tier. A 4 here is always well earned. Shortest par 3 on The Dunes Course at 137m from the back tees. 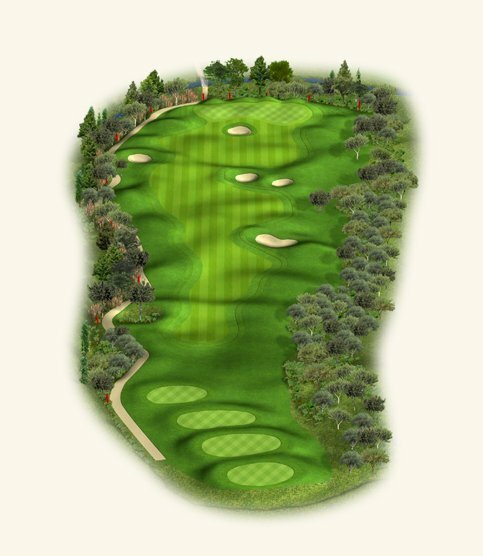 The green is cut in half from front to back by a tier, so try to get your tee shot to stop at the same level as the hole. Luckily it is a short hole because big trouble lurks left, right or long here. If you miss, miss short. This hole gives you a good birdie chance. 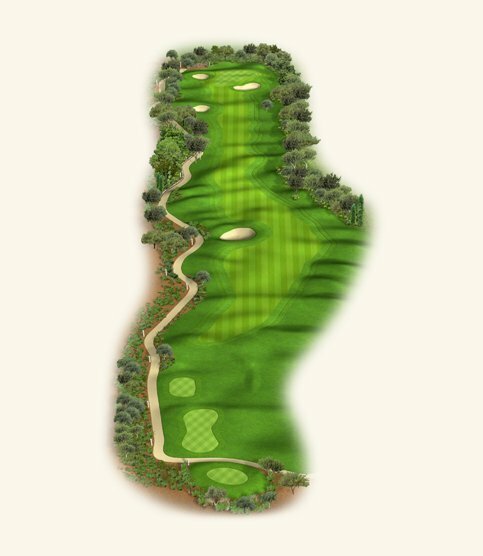 Take the opportunity to look to your right to see the pin position for Hole 7. 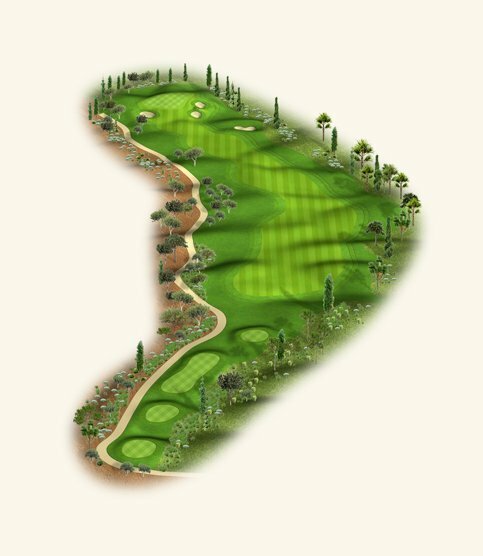 This spectacular risk/reward par 4 is at the highest point of the course, giving you extensive views of the Navarino Dunes facilities and beyond. You can even see The Bay Course if you look carefully. This hole is all about the green. 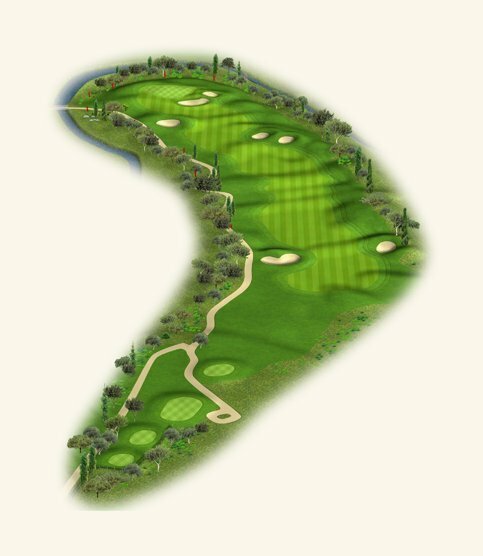 With many large undulations you can easily three- or even four-putt if you don’t place your shot where the hole is located. A good birdie chance, so play to your strengths. Toilets are available after this hole. It is generally always into the prevailing wind and is quite extensively uphill throughout. The tee shot is the easiest part of this hole as there is a wide landing area, just avoid the fairway bunker on the left. This hole though becomes more difficult the closer you get to the green, so always be cautious with your 2nd and 3rd shots. 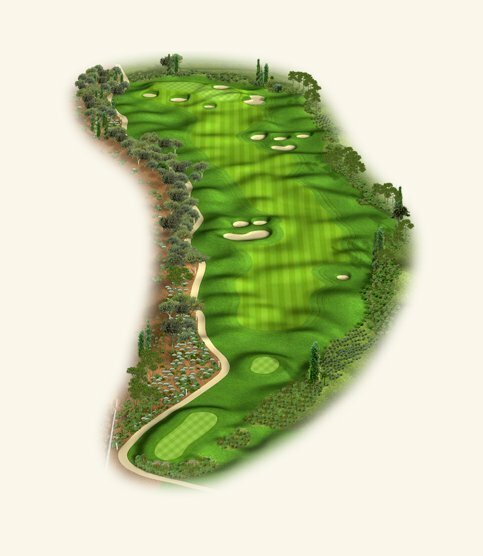 Take into account the wind and uphill slope when making your final approach, allowing at least one to two clubs extra to the three-tier green. Try to get your shot to the same level as the hole and don’t be short! A true test of your game and any par here is very well deserved. Tough par 3 generally playing into the prevailing wind. 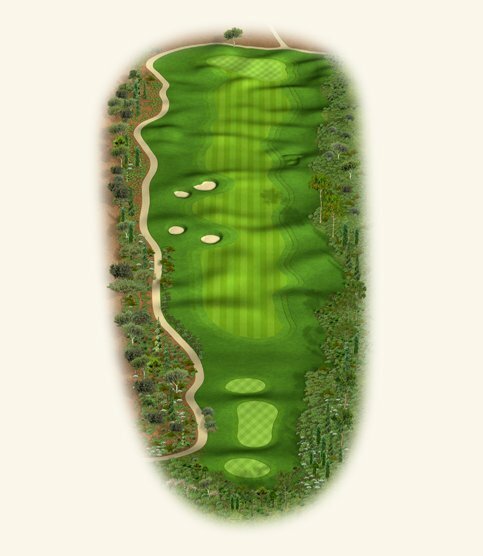 The location of the hole here is very important because the green is almost 50m in length, meaning you could be hitting any one of 5 to 6 different clubs. It is better to miss the green to the right, as the left has a slope pushing your ball towards the Out of Bounds. Again, walk off here with a 3 and you will have caught up a few shots on the field. This hole completes the Front 9 with the Clubhouse in view and generally plays downwind. It is a narrow tee shot due to the fairway bunkers on the left and trees and bushes to the right. A good tee shot will leave a mid-iron to the green that gets more difficult the further left the hole is located. Approach shot should be from the right, allowing the natural undulations of the green to feed your ball towards the hole. Better to miss short than long. After this, make your way to the Halfway House for a much deserved rest. Downhill par 3 which normally plays fairly easy. Try to pick the right club off the tee to ensure an easier putt for your birdie, noting that any miss left or right will result in a difficult up and down. Missing in the greenside bunkers is your best bet. A chance for a good start to your Back 9. Straight away tee shot into a wide fairway with no bunkers to bother you. Slightly blind second shot depending on the pin position, but any shot to the centre of the green should create a good chance to two-putt for par. Be short rather than long with your approach. 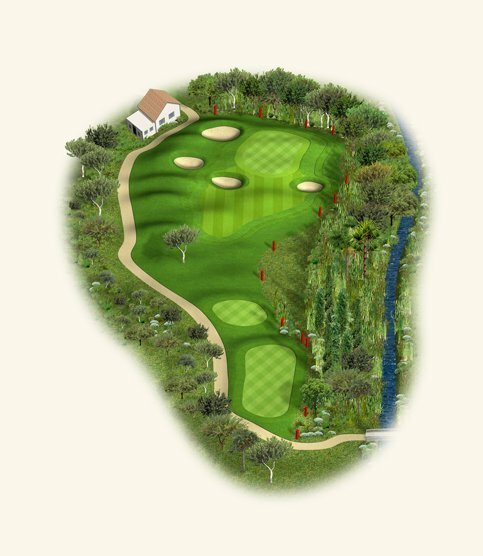 Plays in the opposite direction to Hole 11 and is generally down the prevailing wind. Keep your tee shots towards the right side of the fairway to allow a better approach to the very difficult green. Bail out to the right with your approach shot as anywhere left will spell big trouble and avoid the difficult front left greenside bunker as it is very deep. Great-looking hole from the tee with a hazard on the left and long grass on the right, but don’t worry, the fairway is very generous. The only obstacles to avoid are the fairway bunkers. Don’t go long! This hole is a good chance to make a score. 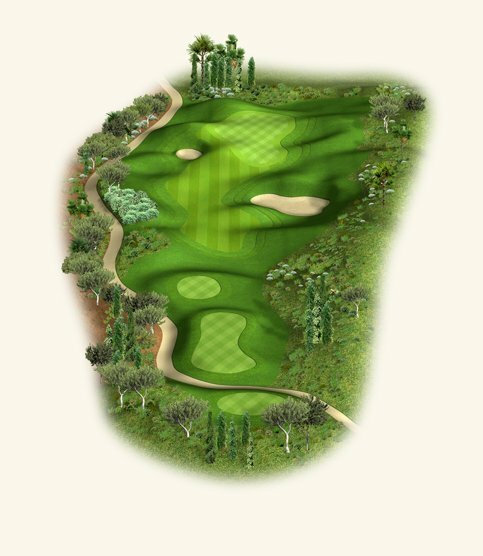 If the hole is located in the back tiered section, then this becomes a difficult proposition, but anywhere in the front part of the green allows for a good birdie chance. It is better to miss the green to the left rather than the right. Toilets are available at this hole. Short par 4 hole that is all about the approach shot into the green. Take the right club off the tee to ensure you have your favored distance into the very tight green with trouble left, right and long. A fairly flat green with a large false front, so don’t be short. Beautiful par 5 with lovely mountain and village views and a large drop in elevation from the tee to the green. This is a semi-blind tee shot between the fairway bunkers and the longer you are off the tee the further left you should aim. This will leave a tough second, again having to thread the ball between more fairway bunkers. Make sure you leave your favorite distance for your 3rd shot into the very undulating, difficult green. 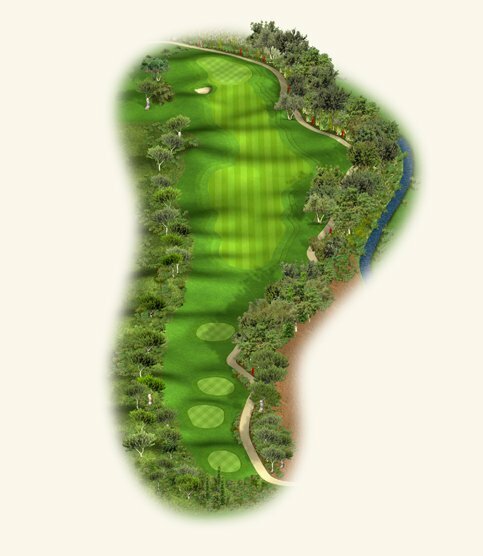 Any hole location towards the back or the right of the green will require a very precise shot to get it close. If you play with caution, then a par or even birdie is possible. 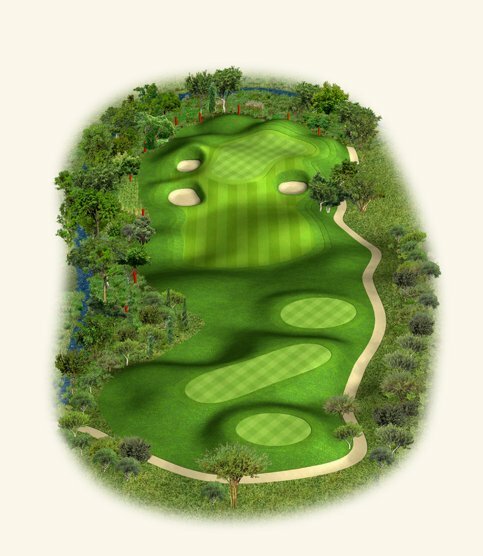 Great par 3 hole with a tier splitting the green in two halves, left and right. Getting your tee shot in the half where the hole is located is advisable. Try to avoid the greenside bunkers short or going long as this will make your par very difficult. A very fitting finishing hole. 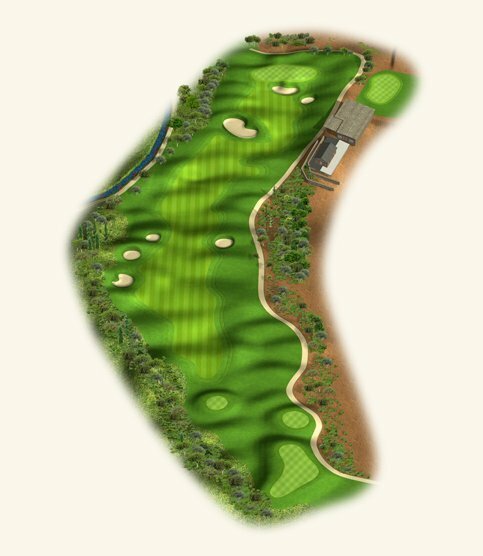 This is a slight dogleg right par 5 with an uphill approach to the green with the Clubhouse to your right. Wide open tee shot where you avoid the bunkers, which should leave a fairly easy second shot. 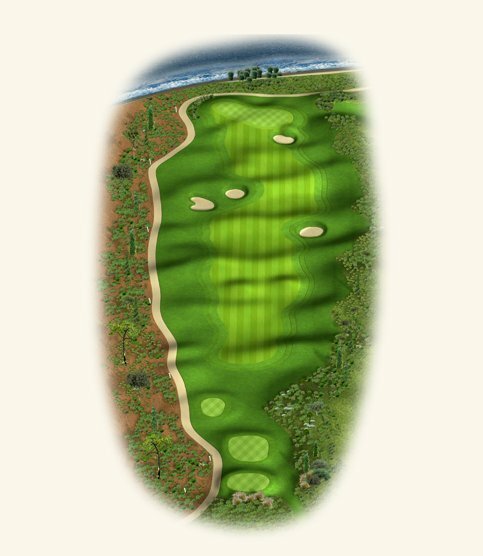 For the better player, a decision will need to be made as to whether you can carry the large fairway bunker 100 meters short of the green; just don’t go in it. 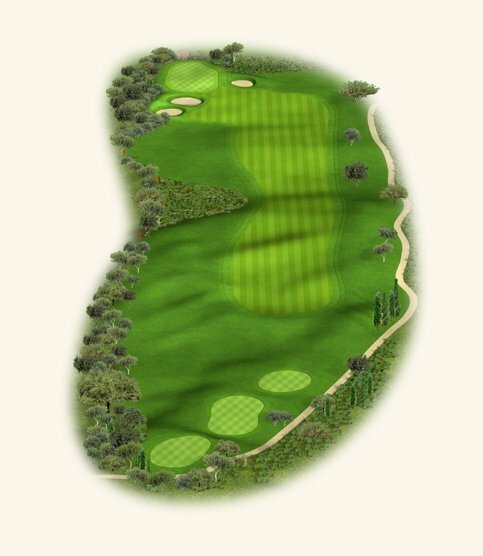 Try to see where the hole is located here as you need to be accurate and on the right part of the sloping green with your approach. Better to miss short rather than long. Chance to finish with a birdie.